All of us are building something. Think about it: We are building a life, a relationship, a marriage, a family, a career, a company, a church ... and the list goes on. You are no doubt doing it with people who, like you, want to succeed. What are they counting on you to bring to the table, and what is it that you are trusting them to bring? 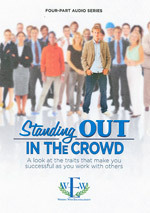 What will it take for you to be a positive contributor where you are building and, as a result, stand out in the crowd? The answers will be revealed in this series.